It’s not officially spring yet, but we think that everyone is ready for warmer days. So to get you warm we’re kicking off our great spring sale on March 12 at 00:00. This is your chance to welcome the new season with Snel.com’s great dedicated server specials. You can save 25% on all in-stock new dedicated server orders. Please note that the coupon cannot be combined with other coupons and the offer ends midnight March 14, 2014 (23:59 CET)! 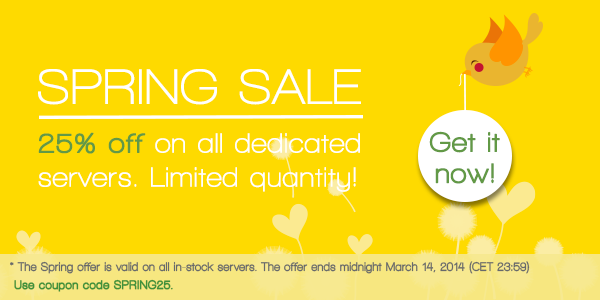 So hurry up, don’t miss out on your chance to save big on your new dedicated server order!